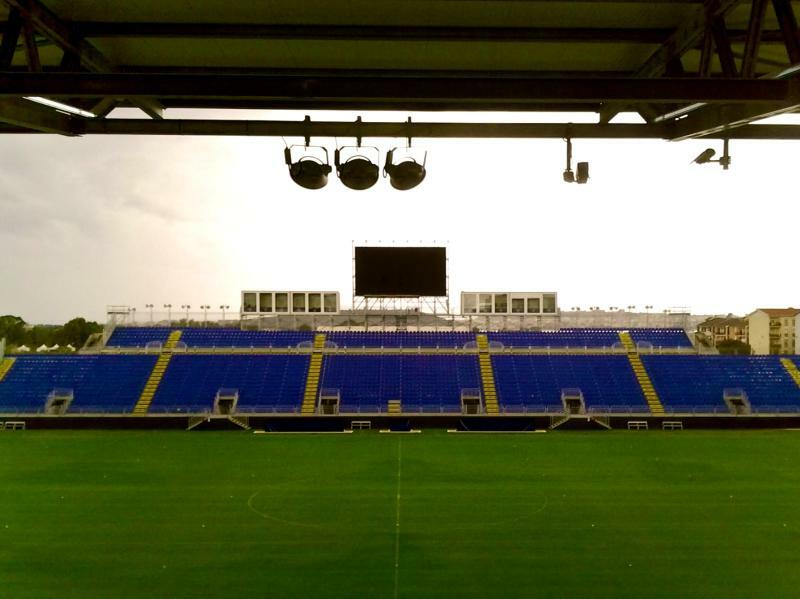 Stadio Is Arena was built in 2012 to serve as a temporary home for Cagliari Calcio. Until then, Cagliari had played their home matches at Stadio Sant’Elia, which by the late 2000s had fallen into complete disrepair. The club advocated a move to a proposed new arena, the Karalis Arena, but plans fell through, which led to a conflict between the club and the city. As a result, Cagliari decided to move out of Stadio Sant’Elia and build a temporary makeshift stadium in the nearby municipality of Quartu Sant’Elena with the intention to stay there for three years while they continued to search for a solution for the Karalis Arena. 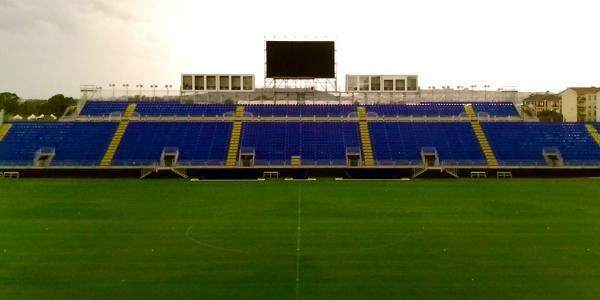 Before Cagliari moved in, Stadio Is Arenas was nothing more than one basic concrete stand, but over the summer of 2012 makeshift scaffold-type stands were erected on all four sides. Works were planned to be finished before the start of the 2012-13 season, but delays meant that the first few games had to get played behind closed doors. The first match at Stadio Is Arenas, a league fixture between Cagliari and Atalanta, was played on the 2nd of September 2012. The first match at the fully completed stadium was played on the 26th of November. Over the 2012-13 season, Stadio Is Arena was the continuous subject of controversies mostly related to the safety status of the stadium, and at one point even involving the arrests of Cagliari chairman Cellino and Quartu major Contini over fraud in acquiring the safety certificates. Before the season was over, Stadio Is Arenas got closed down and Cagliari moved to Stadio Nereo Rocco in Trieste to play their last few home matches. They will start the 2013-14 season at the same stadium before moving back to Stadio Sant’Elia in October 2013. Stadio Is Arenas is located in the south of Quartu Sant’Elena at only 1.5 kilometres from the Mediterranean coast. It lies about 8 kilometres east from Cagliari’s city centre. From Cagliari, the stadium can be reached with bus PF (toward Flumini). Take the bus from Matteotti or the Via Roma in Cagliari’s historic centre. Get off at stop San Benedetto (Piscina), from where it is a 10-minute walk to the stadium. Buses run about twice an hour. If arriving by car, it is likely easiest to follow the coastal route east, and to turn left to Quartu at the roundabout in the middle of the coastal lakes. Just after having entered the city turn left onto the Via Salieri and then right onto the Via Beethoven. Stadio Is Arenas lies shortly ahead on the left of the road. Cagliaricalcio.net – Official website of Cagliari Calcio. Visitacagliari.it – Tourist information for the city of Cagliari. Ctmcagliari.it – Information about Cagliari public transport.